Greetings blog friends and thanks for stopping by. I've been on a hiatus for a period of time enjoying the Christmas Holiday and New Year. Today I am posting an art card I made for a special friend in the Lord, Carol Ann. She clearly shines the light of Jesus in her walk with the Lord and is a living testimony to me of her deep faith in Christ. This is a 6 x 6 size art card starting with a piece of mat board you would use for matting a picture in a frame. I've started putting several of my cards on this type of background because they are much more stable and stand up better when there is so much weight added to the front. I added an easel to the back of the card so it will stand up on it's own. This is of course a Magnolia stamp that I colored with Copic markers. I made the tiny brown flowers using﻿ an Impression Obsession die (DIE042-I), the small brown flower was made using the medium sized die from Spellbinders Bitty Blossoms, and the pink polka dot flower is the Spellbinders Daisy Flower Topper. I used a Cherry Lynn Fanciful Flourish Right under the pink polka dot flower, the tiny pine branch under the brown flowers is an Impression Obsession die (DIE023-X), and the other beige branch is a Sizzix - Flower & Leaf #3 Sizzlit. The sentiment die is from the Spellbinders Twisted Metal Tags and Accents collection and the sentiment if from Close to My Heart (S1311 Illuminate - Stamp of the month). 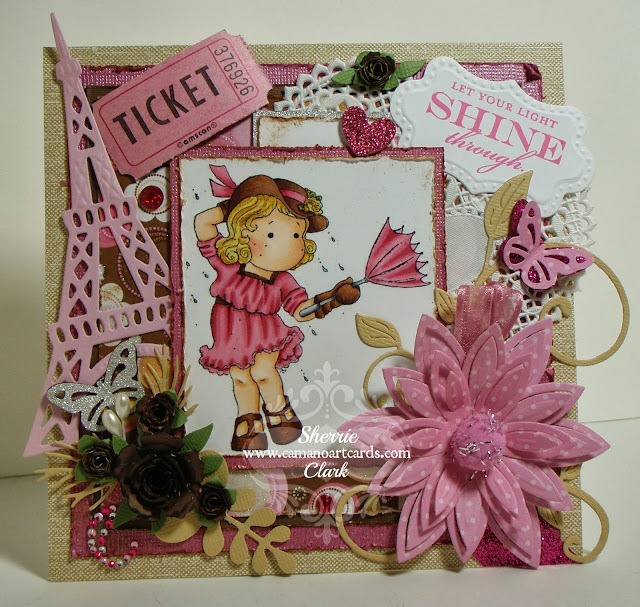 The Eifel Tower die is from Spellbinders French Frills. As you can see there is a lot of layers, distressing of the edges, bling, heart shaped lace doily, a ticket stub, and butterflies using a Martha Stewart punch. That should just about cover all the extras attached to the card. If you have questions, please feel free to ask me a question under comments.